Getting up to “manage” the animals is a time-honored, if sleep-interrupting tradition. The usual time for this is the crack of dawn. Unfortunately our sleep habits make this too #$%^ early. The animals disagree but I firmly believe that if our animals had a snooze button they would be getting up at a civilized afternoon hour like the rest of us. Letting the chickens out of the coop is the priority, since they fuss about knowing that the lazy geese and ducks are eating up nature's bounty that must have sprung up overnight while they were locked in their cell. 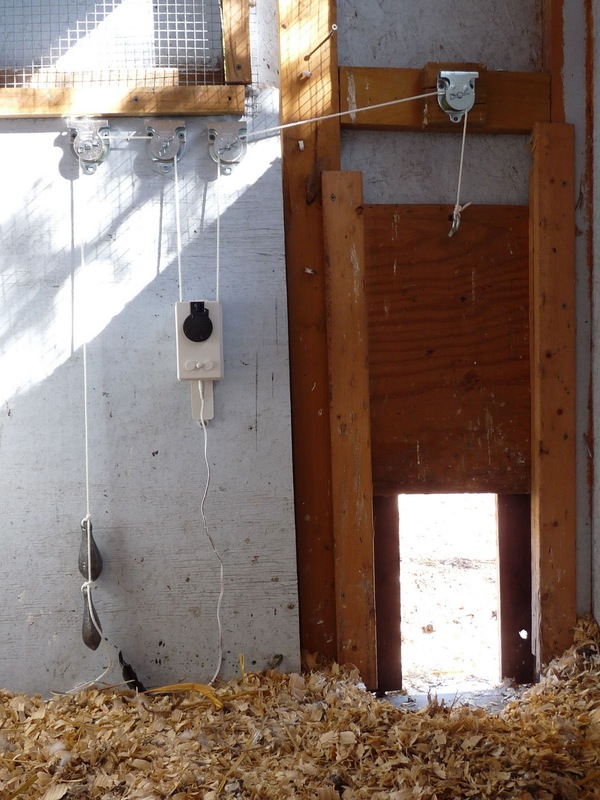 In order to free them from their sleeping quarters (and allow me to stay in mine) I have tried several methods of automating the chicken coop door. The first was a process control system that was cool but expensive and rejected after an expensive part failed. 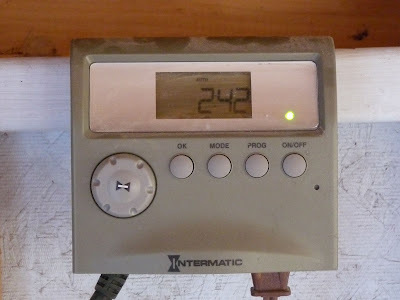 The cheaper alternative we used for several months was based on an inexpensive power screw driver and an outdoor timer. I modeled it on the one shown here. The screwdriver displayed is no longer available and I had to adapt it to the cheapest cordless screwdriver Harbor Freight had available. This solution worked well but would commit suicide unless we kept the area under the door free of debris. The chickens seem to sense this and deposited as much “debris” as possible. It would take a couple of hours to remove the burned-out relay and solder in another. Finally I read about the drapery motor. Yup - d.a. re-decorated the coop with roman shades… uh no. There is a drapery motor that will run one way and then the other as power is applied. It is a little pricey but I was tired of inhaling solder fumes and it was worth a try. It worked great all summer, but when it got cold the rubber wheel that the rope travels on started to slip. I tried fixing it with a thinner, rougher twine. This worked for a few days until the twine got wrapped up in the roller and the motor fried itself. The replacement twine was too thin. We ordered another motor. I changed the design to include some pulleys and a counterweight so the motor wasn’t doing all the hard work. The result is shown below. I have since added a sheet metal cover to keep the chickens from bombing the drapery motor with more “debris”. stupendously huge skillet breakfast & a haircut: two bits! 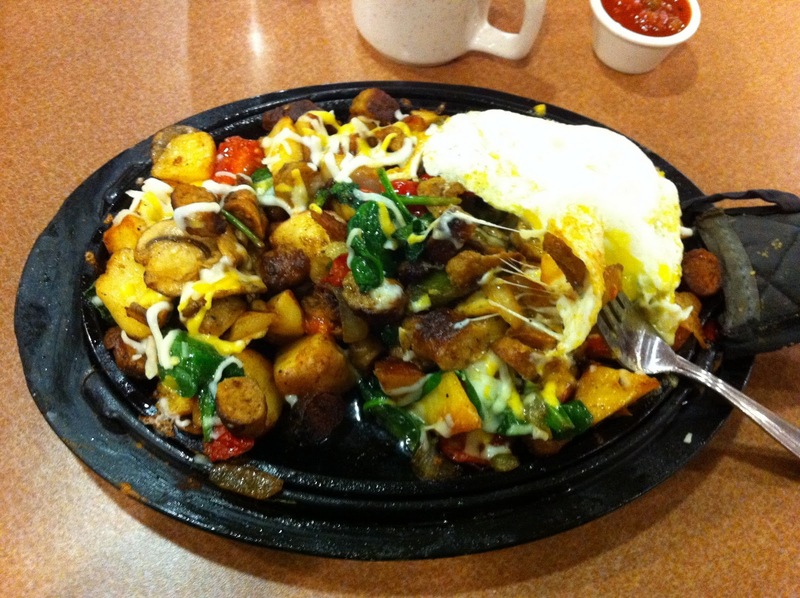 pic: the stupendously huge skillet breakfast. Fell asleep around 1:00AM, woke to the alarm at 3:00AM. Took Spouse to the airport so he could see his folks for a few days (we're down to one car at the moment). Stopped at Major Chain Diner after drop-off - was inexplicably ravenous at 4:30AM. Forgot how these diners serve stupendously huge entrees. The skillet breakfast was filling, and more than two-thirds was still on the plate when I finished. 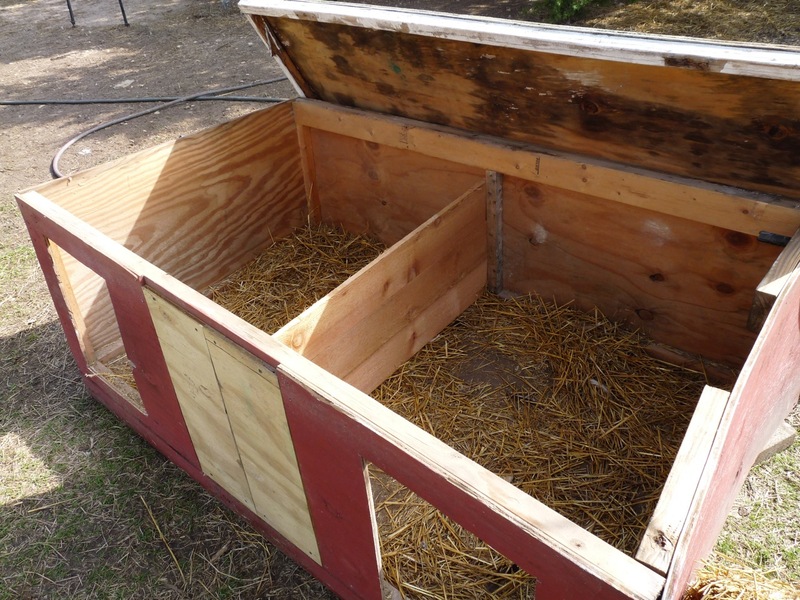 Boxed it up for the chickens. Once home, briefly napped until dawn chores called. Gave the chickens the still-warm skillet breakfast (chopped up into smaller bits). The chickens couldn't finish the skillet breakfast either. The dogs selflessly worked cleanup detail. Having had real caffeinated coffee with the stupendously huge breakfast ensured that a goodly nap would be elusive for the rest of the day. Decided to chance going into the city to get *cue dramatic music*: a haircut. Getting a haircut has become a Very Big Deal, full of Angstyness and Gnashing of Teeth. My local stylist left the area almost two years ago (d@mmit! ), and every stylist since then has either given me a bubblehead cut or an 80's Rick Springfield 'do (not being as cute as '80's Rick Springfield, I can't carry that look). Summertime is no problem: give me a #6 guard on an electric hair trimmer and a pair of thinning shears, and I can wrangle a basic short style. It's the Fall and Winter where I run into trouble, letting the hair grow out for warmth. So I pulled up my Big Girl Britches, dusted off the credit card, and went back to Ritzy (Yet Still A Chain) Salon. It'd been what - over three years since I last went there? Since I last had a salaried IT job, anyways. Painfully expensive, but for reason - they give great cuts. They're now giving free trims between cuts, probably due to the economy but still, thank goodness - it makes their prices a bit easier to swallow. I've now a growing-it-out, grownup modern 'do that is presentable enough for upcoming client-facing work. Home again home again, jiggity-jog, and look at the time: need to muck out the 4'x6' duck pond. [Funny, it used to be "the goose pond", then it became "the goose & duck pond", now it's "the duck pond". 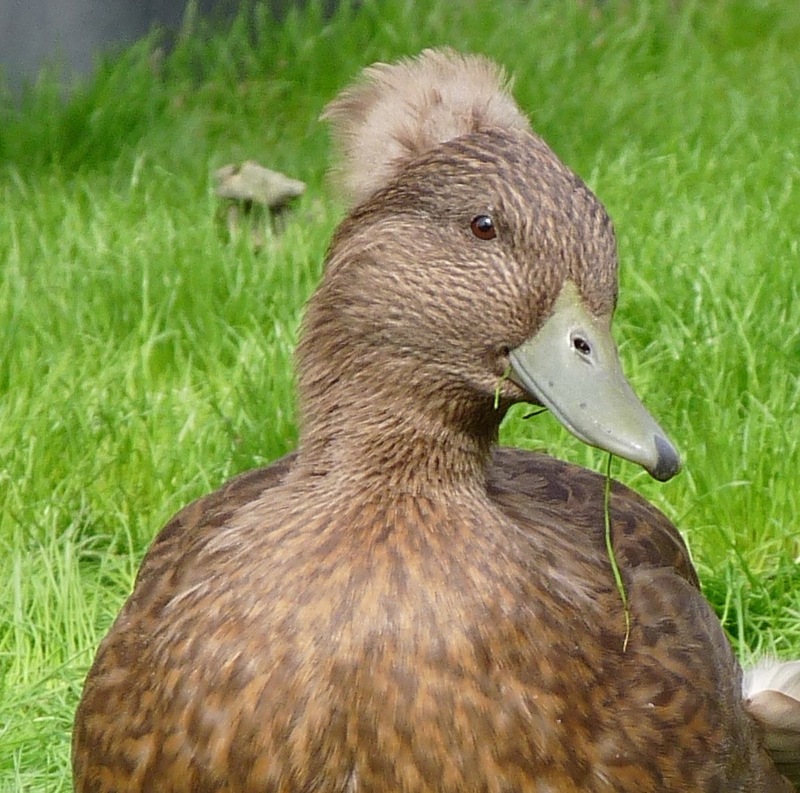 The ducks have definitively taken over. They have a flag.] 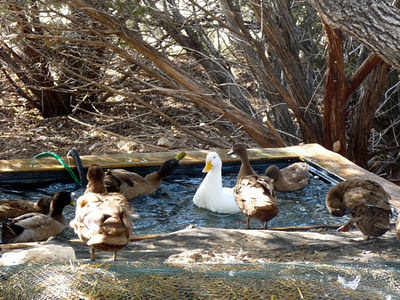 The ducks vacate the duck pond by late afternoon for the pools on the other side of the house - they love their routine. Can almost set your watch by it, if your watch is a sundial. Anyhow, presented my new hairdo to the chickens, geese, ducks & dogs. They had no comment. I don't think the birds looked past my knees, to be honest. The dogs were probably hoping for more stupendously huge breakfast goodies. My, how one's ego gets checked on the farm! Clad my glamorous self in work clothes and rubber boots, and got to mucking. d.a. writes: I've been waiting for Spouse to write an article on how he made this amazing smoker. He finally did. Consider this a holiday gift to all of you, our half-dozen readers who make the time to grace this humble blog. Thank you! I did some more clicking, err... research and found this: the mother of all Ugly Drum Smoker threads. 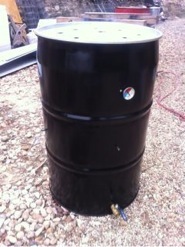 Ugly drum smokers are the DIY version of the Big Drum Smoker I posted above. The thread has been actively open for 4 years and there are thousands of posts. I read the whole thing over several weeks. I decided that this is what I wanted to do. In fact, I have done it three times, with the first two being given as gifts to family and friends. I love this smoker. Although the temperature inside is 225℉, the outside is not nearly as hot as the old side firebox. I have asbestos hands due to childhood labor issues (thanks Dad), and can move the grill even while it is running. It makes good smoke on just a small amount of wood and does it for a long time. I can get 12 hours of smoking with just the initial load of wood (actually, the only load because I have never needed to smoke anything longer than 10 hours). I'll smoke two or three different things during the day. The first three hours I will smoke 5 to 10 lbs of beef teriyaki jerky. 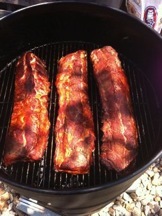 The next 6 hours are for three racks of baby back ribs. And if I time it right, I can put on chicken for dinner. You can read the thread to get your own ideas but after the three different builds I have refined what works well for me. Take a 55-gallon food-grade steel drum - thoroughly cleaned using fire inside the barrel (a big fire), then steel discs and wire brushes. 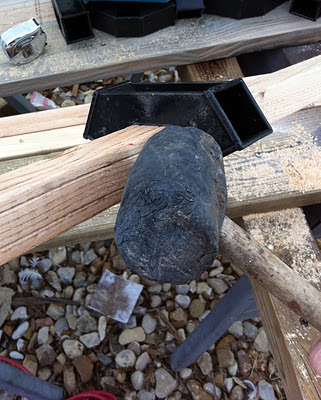 Build a firebox – something that holds the wood while still allowing air to circulate. Here is my current one made out of expanded steel and a Weber grill grate, bolted to an aluminum pan that catches the ash. Drill holes in the bottom to allow air into the smoker. Since all but one of these is closed after the smoker comes up to temp, I use press-in caps that fit the holes, but some people use flexible refrigerator magnets to cover the holes as needed. I also have a valve installed in one of the holes to regulate the air. You can see it at the bottom of the smoker below. 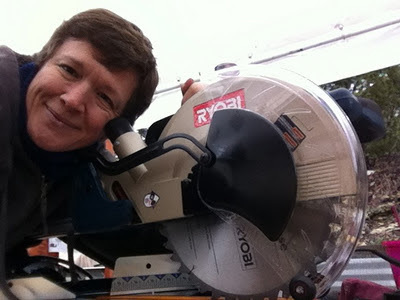 I also drill holes – lots of holes. You need holes for the screws that hold the grates, holes for the temperature gauge, holes for handles, holes in the lid to let the smoke out, etc. I found that a stepped drill bit was the best way to drill different sized holes in the thin metal walls of the barrel. I used to think these kinds of bits were a toy but they really work for this application. It just so happens that a Weber kettle grate fits perfectly inside the barrel, and if you have a full size weber kettle barbecue you might also find that that the lid fits your barrel (but your mileage may vary as it depends on the barrel you use). I use either the original lid to the barrel or a commercial wok I got at a restaurant supply store for $25. 2. Keep the distance from the food and the fire at least 24 inches. My firebox is a little tall so I actually have the grates within an inch of the lip of the barrel and have to use the domed lid. 3. Clean the barrel very well. A lot of food grade barrels have a phenolic coating that has to be removed to prevent bad things getting into your food. 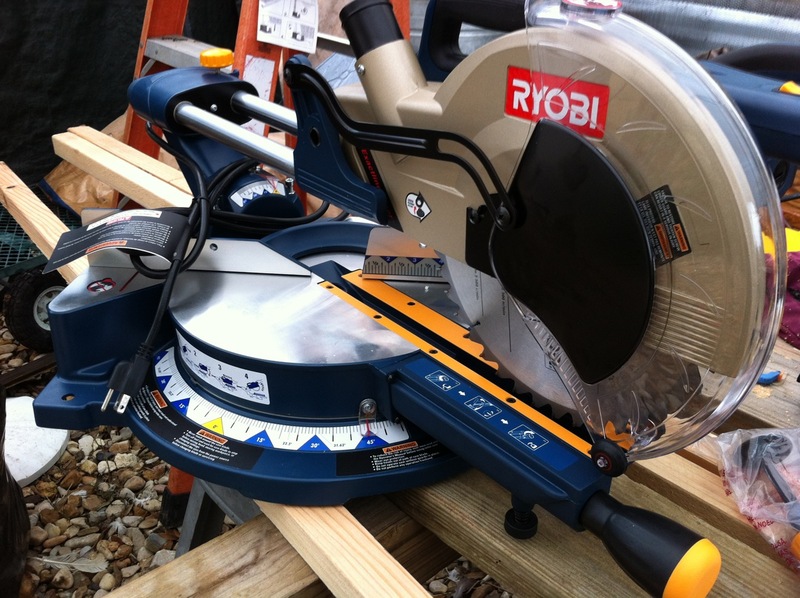 You might be able to get a new steel barrel without any coating. If you have a local source that is what I would recommend. It takes a lot of work to prepare a 25-dollar used barrel and it might be worth the extra 40 for a new one. 4. Do not use galvanized metal in any of your internal fittings. Galvanized metal starts to off-gas once it reached 400℉. I use black iron or stainless steel in all the fittings. 5. 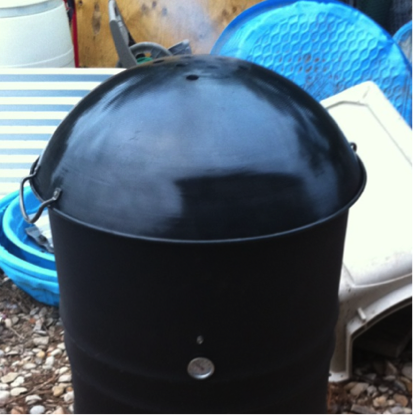 Do some research: there are lots of web pages that show you how to make a ugly drum smoker for anyone at any skill level. Go learn from their mistakes and figure out ways to make new ones. d.a. says I am the king of finding new mistakes. Did ya hear that? I am the KING…wait a minute. 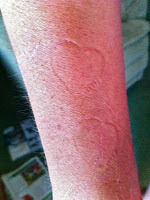 Pic: these ain't "love" bites. 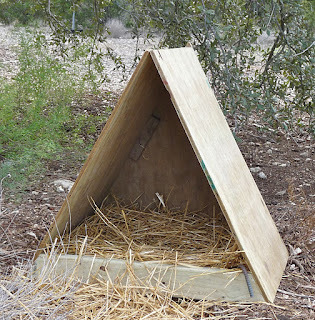 2012/02/06 Update to article: the geese are using these nest boxes, hooray!! 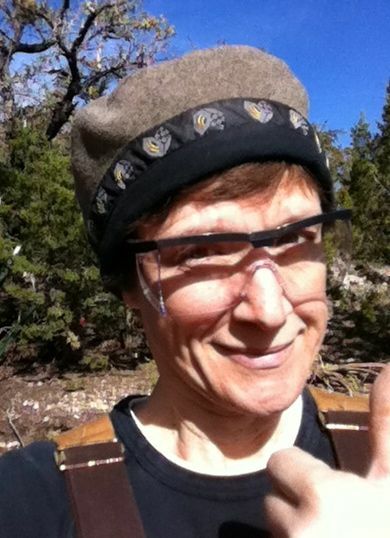 Soon it will be time to dust off the Kevlar arm braces and prep for egg gathering season! Depending on the weather, our geese start egg-laying anytime from Winter Solstice to late January, and will continue to lay eggs anywhere from April to late May. It's a dangerous time... if you're not a goose. The geese get wicked crabby, extremely territorial, and will gang-up, bite & wing-beat ANYTHING that gets anywhere near a nest. Our geese like to nest in areas they can defend from other animals (including each other), and wherever they're not supposed to be. 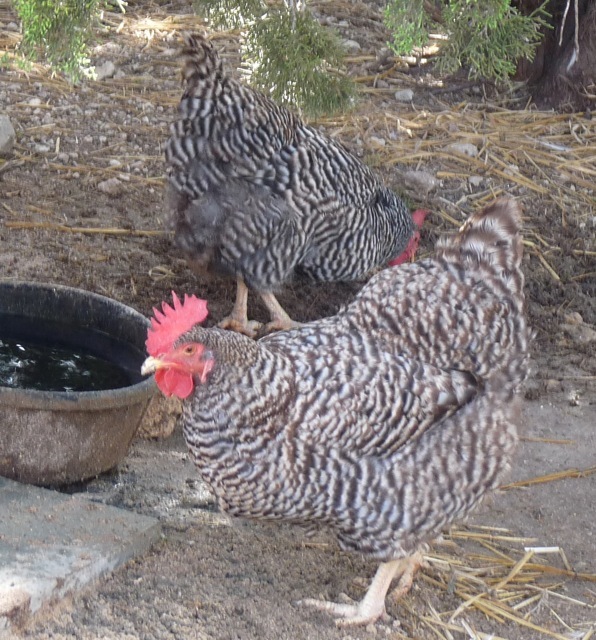 We don't let this batch hatch little ones - too many genetic problems from the commercial breeder we bought them from - but we do gather and sell their fresh eggs. If Maggie didn't steal so many before we can get to them, one season's-worth of eggs would probably pay for their entire year of feed. Dave Holderread briefly discusses goose nesting options on pages 96-97 of his book "The Book of Geese". We decided to try out the A-frame nest box this year. The author also suggests setting the nesting boxes out several weeks early so the geese can get used to them - ahh, we may be cutting it a bit short. 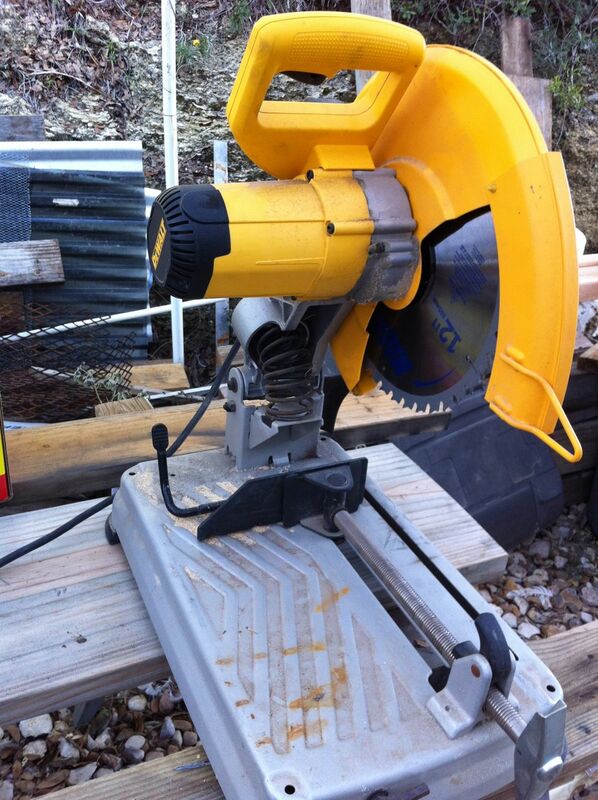 We put the new mitre saw to work on this project. Two pressure-treated 2"x4"s, cut 24" 30" long at the base and at a 30-degree angle. Two pieces of 24" 30" x 28(?)" outdoor plywood for the angled walls. We traced the outline of the back of the nesting box onto plywood to get the backing. A couple screws, some holes drilled into the backing for air flow, some caulking at the top to keep out water, and that was it. I staked down the front of the boxes with some bent rebar Spouse had laying around to keep any gusts of wind from tipping the shelter over. 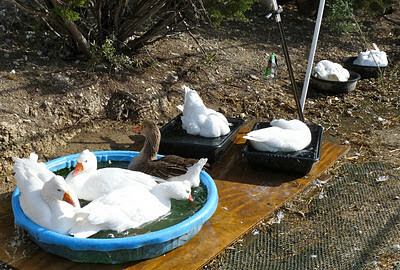 Dave Holderread suggested one box for every six to eight geese. 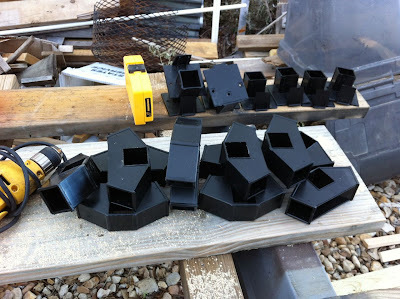 We only have six females, but we went ahead and made four boxes - we've seen how our girls fight over nesting spots. Pic: modified again goose shelter. We also modified the big goose shelter (yet again). It's gone from having one opening, to three openings, to now having two openings. It is consistently ignored by the geese, although the chickens like huddle inside when it's raining. Spouse closed up the the middle opening and put in a divider wall down the center, so two geese can (hopefully) feel snug enough and private enough to nest in peace. Now there's six nice nesting boxes for them to use this year. Anyone care to take bets on whether they'll use these boxes or not? Anyone?? Guess What Mama Got For the Holidays? It was a slow start to the temporary greenhouse project. First I moved the side yard 10'x20' shade structure over next to our shed, so Spouse and I could have a protected area to do our construction projects, rain or shine. That led to cleaning up and organizing the wood piles (they were in the way), adding more shelves to the temporary shed (to hold the tools and other stuff that was in the way), and carting off two bags of junk and detritus. 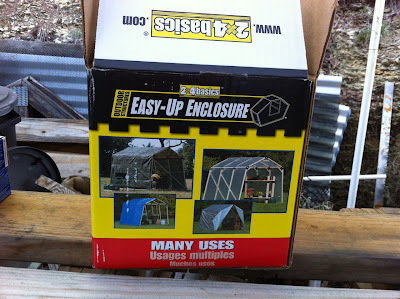 It was a roundabout way of getting started on the greenhouse project, to be sure. ...and here are the parts. You provide the cut wood, and slide the parts into or through the various pieces, then screw the plastic parts to the wood to ensure a stable connection. 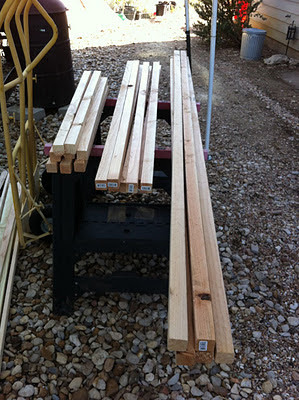 The required wood, all cut to specification. The pieces would not easily slide onto the 2"x2"s, so I had to (gently, gently) tap with a rubber mallet to get the pieces onto the wood. See the groove marks the piece is scratching into the wood? Those are from little nubs on the inside that are supposed to help the plastic piece(s) grip the wood tightly. It's doing a dang fine job. One of the pieces busted. There are no spare parts. 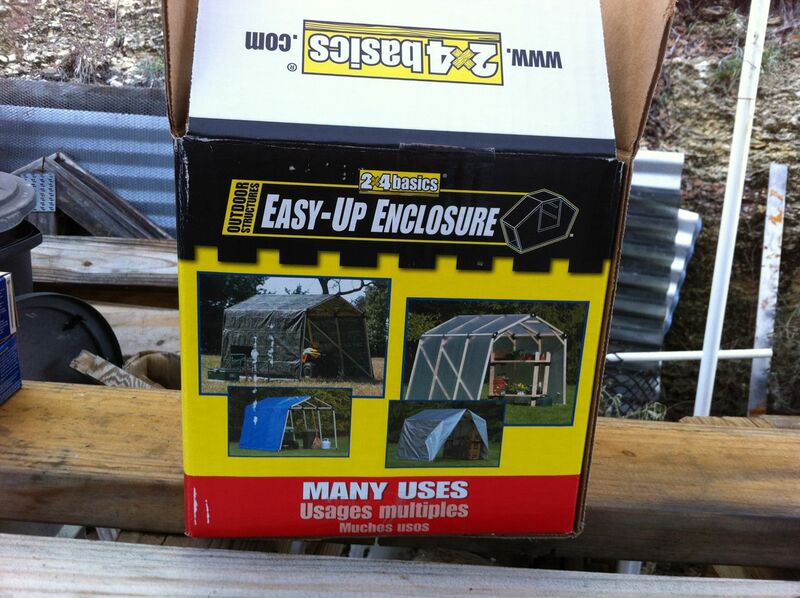 Even if I put together the rest of the enclosure, there'd be some serious weakness in the structure. I no longer have my receipt from Amazon, so I can't even return the box, nor the greenhouse cover (which was a separate purchase). Waiting for Spouse to get home to see if there's a way we can rig up a fix. Regardless, there's no guarantees that the other plastic pieces won't break as well. Aiiieeee!!!! - @dasparky Cleaning out the coop, a #hen let me know in no uncertain terms that a quiet nestbox was needed. Taking break while she lays her egg. The Barred Plymouth Rocks are bossy like that. 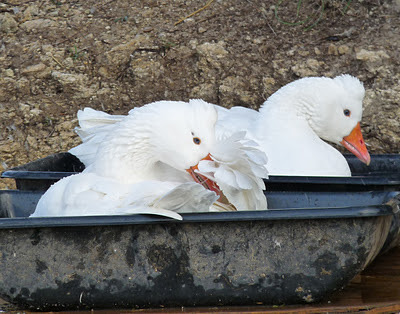 The geese, not wanting to be left out, have decided to clean themselves en masse as well. In every water container they can find. One of those days where one can't rush the river.